The Bernard and Irene Schwartz Postdoctoral Fellows Program was established in 2005 to foster a vibrant scholarly relationship between the New-York Historical Society and The New School. 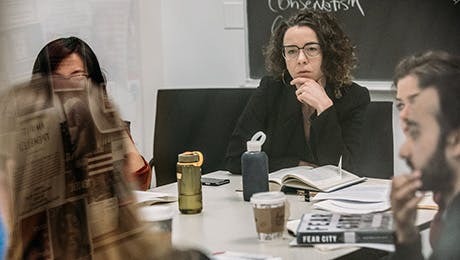 Postdoctoral fellows are invited to help build this connection through research, teaching, and public history programming. The positions are open to scholars who will have completed a PhD in History or American Studies before the end of the academic year of their application. In the course of a one-year (non-renewable) fellowship, Bernard and Irene Schwartz fellows develop a major research project with New-York Historical Society resources, teach two undergraduate courses at The New School's Eugene Lang College, and share in both institutions’ commitments to public history. Schwartz Postdoctoral Fellows have an outstanding record of producing distinguished scholarship during and after the program, and have proceeded to positions at diverse institutions.